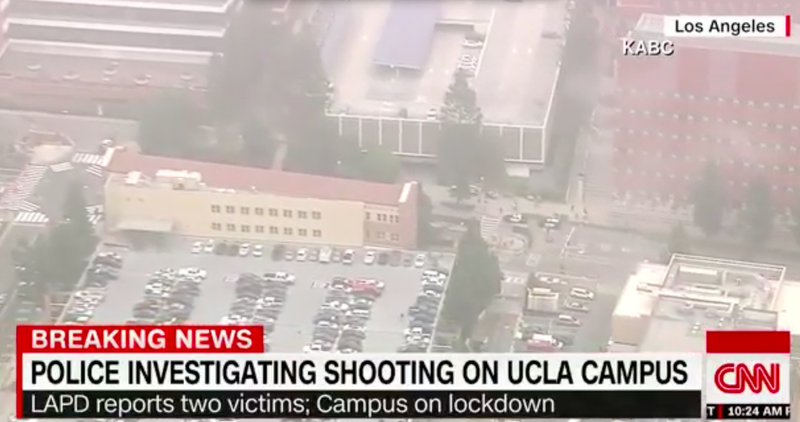 There has been a shooting on the campus of UCLA on Wednesday, June 1, 2016. The incident occurred around 10 a.m. Pacific time. Reports are that three gunshots were heard in Engineering Building No. 4. 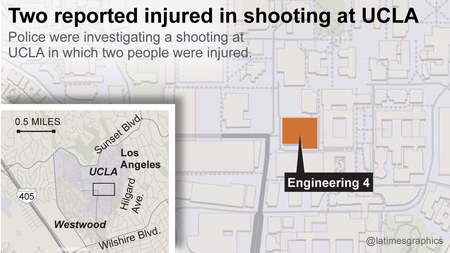 Two people were first said to be injured, but by 11:30 a.m., LAPD said they were dead. The FBI and the U.S. Bureau of Alcohol, Tobacco, Firearms and Explosives were responding, the agencies said. 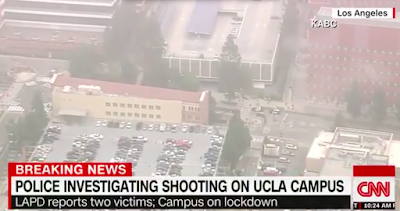 The Los Angeles Police Department was placed on citywide tactical alert and sent hundreds of officers to the Westwood campus and surrounding neighborhoods around 10:30 a.m. The motive for the shooting was not immediately clear, law enforcement officials told The Times. 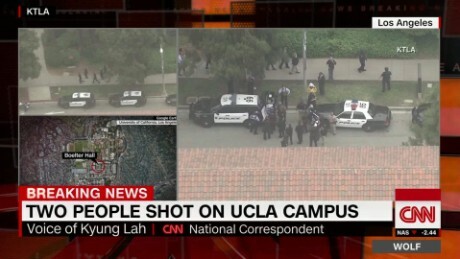 According to the Daily Bruin, the shooter was wearing a black jacket and black pants. Sean Lynch, the son of a professor who works in the engineering building, was exchanging text messages with his father as the campus was placed on lockdown. Lynch said his father was in a colleague’s office and heard three gunshots, but did not see the shooters. Whether this is a murder-suicide or a shooting of two males with an unknown suspect still on the loose is unclear from the LAPD news conference held at 11:35 a.m. Pacific. Campus police, however, are reporting a suicide note and a handgun have been found at the scene. 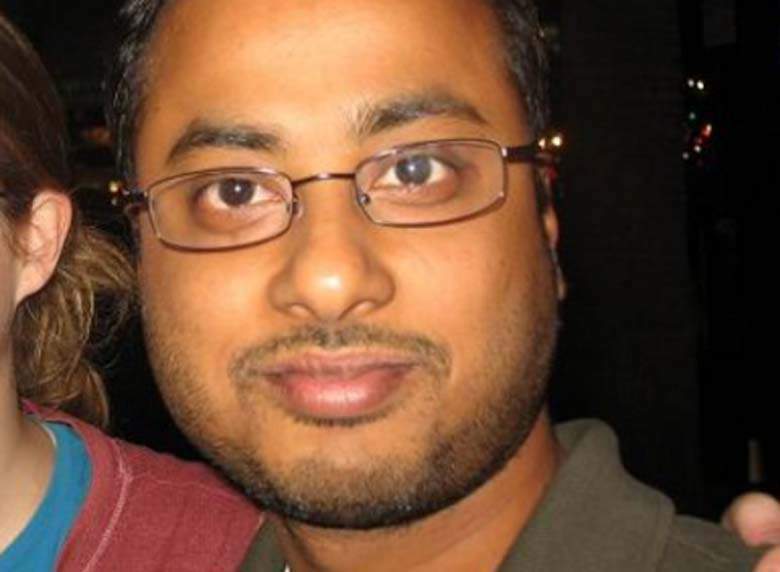 The suspect in the shooting of a UCLA professor has been named as PhD candidate Mainak Sarkar. The victim was Professor William Klug. 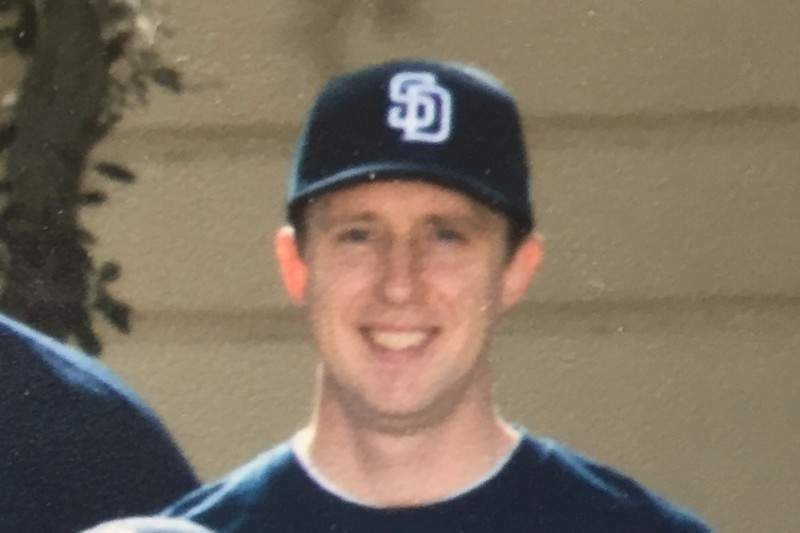 He was a teacher in Mechanical and Aerospace Engineering, according to his official bio on the school’s website. Sarkar was first named in a report by CBS News. He was a native of Minneapolis and had a PhD in solid mechanics from UCLA. Sardar, which is Indian (Bengal) and Bangladeshi, is a Hindu name found in several communities, from a title based on Persian sarkar "chief," "superintendent," "lord." Mainak generally means "a mountain, a Himalayan peak," and is of Indian origin. A person with the name Mainak are mainly Hindu by religion. Klug is an ancient German surname first recorded in the early 14th century, at the beginning of the use of hereditary surnames, in Europe. Recorded as Klug, Kluge, Kluger, Klugmann, Clugel, and the diminutive Clugelin, it originates from a pre-7th century word klouc meaning "noble" or "refined." In German, the meaning of the name William is "resolute protector" and "will." 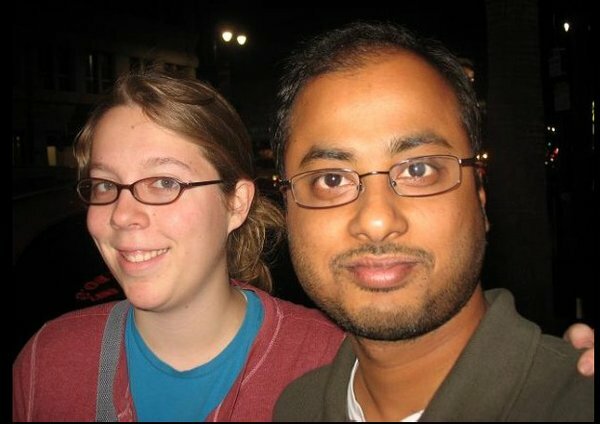 Ashley Hasti, 31, whose last Facebook photo with Sarkar dates back to 2011, has been confirmed as a student at the University of Minnesota Medical School and a former tutor at North Hennepin Technical College. She did not appear to be Facebook friends with Mainak Sarkar at the time of her death. Brooklyn Park police discovered Hasti’s body at 12:35 a.m. Thursday (June 2, 2016) after her name was found on a “kill list” Sarkar left in his St. Paul apartment. She died of an apparent gunshot wound, according to a Brooklyn Park police official. Hasti first enrolled at the University of Minnesota Medical Schol in 2012. In 2008, she received a bachelor’s degree from the U in Asian languages and literature, a U spokesman said. Source.